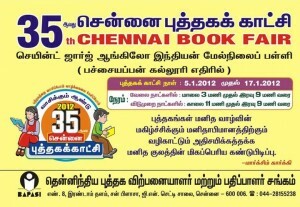 For all the book lovers (or Worms) BAPASI will have 35th Chennai Book Fair @ St. George Anglo Indian Hr. Secondary School. With respect to History books two members of our group are releasing their book. I am expecting that day to buy new tamil books. I am waiting for this….to buy a books for my son. me too expecting to buy various range of books. I am visiting from MIZORAM to Chennai in the same period. I have planned to purchase many books at 35th Chennaibookfair! Kindly change the date as it reflects as 05:01:2012 to 17:01:2011. Do we have a book fair in this December? Can Someone tell the exact location? Please check the Venue mentioned above. I am a resident of Kerala and I make use of the opportunity to buy Tamil books at Chennai Book Fair. I have already noted down the stall list and the layout of the stalls. I am interested in spiritual books, region centered novels etc. I am waiting eagerly for the Book fair. I request you to provide seating facilities at the Book Fair for old people. i am waiting for chennai book fair for buy some tamil books. bcoz i am book worm.. and then i plan to do one record. that is i donate blood past 3 book fairs. so i donate blood continuously in chennai book fair. and i collect all the certificate to show my son or daughter for appreciation. i donate blood till chennai book fair is end. Could you please plan to extend the timings say from 10.am. Every year i try to make it as early as possible but by 4.30 it gets too crowded. If the timing are extended it would be very useful for people like me and for sure the senior citizens. am eagerly waiting for the day……..
pls tell me the timing on saturday for book fair.. I am planning to visit the Book Fair. I am waiting for that festival…. I appreciate your efforts to organize a book fair every year. I had visited the previous book fairs and I have bought very vauable books. I expect the same this year too. I think there is misunderstanding that the book fair is organized by us. Which is not true. Our group do have writers whose historical books are being released this year. And also we are book lovers. If the above blog post convey that we are the organizer, please accept my apologies. I will update the post. yaah i am very happy.i want to buy so many books especially kalki’s ponniyin selvan and meera’s kavithaikal plus karpanaikal is equal to kagithangal.another good news is our organisation plan to put one stall having full of wellness book.if u want go n get it. I visit Chennai during this time from Stockholm, i am waiting to make use of this opportunity to buy a lot of children books for my daughter. Thank u all for arranging. THE DURATION OF THE EXHIBITION MUST BE INCREASED. i give the advance money to buy the book. but he cant send the book . so dont believe the book fair(RAMESH PUBLISHING HOUSE)…………. I missed this book fair event, pl advise the other book fair event schedule . i want to know the chennai book fair 2013 dates and venue and timings.